This year, the meeting runs from Monday through Friday, Dec. 10 – 14, at the Walter E. Washington Convention Center, 801 Mt Vernon Pl NW, Washington, DC 20001. The National Mall from Lincoln’s memorial. Press field trips + workshop – register now! Please visit the 2018 Fall Meeting Media Center to view previous media advisories that include information about searching the scientific program and visa information for international reporters. For any questions about the Fall Meeting or information included in this advisory, email news@agu.org. Online press registration for the Fall Meeting is open. Please pre-register to expedite the on-site badge pick-up process. It is not required to wait for press registration approval before booking a hotel room, nor is it required to book a hotel room when registering to attend the meeting. Hotels sell out quickly and AGU encourages members of the media to book hotel rooms as soon as possible to take advantage of preferential rates. Check the online Who’s Coming list of journalists and press officers who have registered for the meeting. This list is updated regularly. 2. Online resources – now live! During Fall Meeting, journalists can find many resources online in the Fall Meeting Media Center. Public information officers (PIOs) can now post press releases and other materials to the site. For journalists: In the Virtual Press Room, journalists can find press releases, press conference materials (including PowerPoint presentations, images, videos, scientific papers, and more, as available) and other information. Videos of press conferences will be added to the Virtual Press Room during the meeting for easy online access. For public information officers: PIOs can now share press releases and other materials in the Virtual Press Room by directly uploading them via the Press Item Uploader. PIOs can upload press releases, tip sheets and press conference materials to the Virtual Press Room at any time before or during the meeting. PIOs can also upload materials and schedule them to publish at a later date. Note: PIOs do not need to register to upload press items to the Virtual Press Room. However, only public information and press officers of recognized scientific societies, educational institutions, government agencies and non-profit Earth and space science research organizations are eligible to upload press items. The AGU press office may remove any items posted by press officers who do not meet these criteria. 3. Expert tools – now live! The Find an Expert tool allows PIOs to list scientific experts who are available to be interviewed by reporters at the meeting. This tool is now available online in the Fall Meeting Media Center. For journalists: With the Find an Expert tool, reporters can search a list of scientific experts in various topic areas who are at the meeting and available for interviews. These experts have been listed by PIOs from recognized scientific societies, educational institutions, government agencies and non-profit Earth and space science research organizations. For public information officers: With the Find an Expert tool, PIOs can list up to 10 scientific experts who are at the meeting and available for interviews with reporters. Reporters can then search the list of available experts for scientists who meet their needs. PIOs do not need to register to list an expert; they simply need to fill out the “List an Expert” form at the bottom of the Find an Expert page. Note: PIOs do not need to register to list an expert on the Find an Expert page. However, only public information and press officers of recognized scientific societies, educational institutions, government agencies and non-profit Earth and space science research organizations are eligible to list experts. The AGU press office may remove any experts posted by press officers who do not meet these criteria. More information about the Find an Expert tool can be found in the Fall Meeting Media Center. AGU Public Information staff and veteran reporter Katherine Kornei shared their secrets for navigating the 2018 Fall Meeting during a webinar November 14. Watch a recording of the webinar here and download the webinar slides here. Apple Vice President of Environment, Policy and Social Initiatives Lisa Jackson will deliver the Presidential Forum Lecture on Monday, 10 December from 12:30 – 1:30 p.m.
Amazon Head of Worldwide Sustainability Kara Hurst will deliver the Data Plenary on Monday, 10 December from 6:15 – 7:15 p.m. Photographer James Balog, founder and director of the Earth Vision Institute and Extreme Ice Survey, will deliver the Frontiers of Geophysics Lecture on 11 Tuesday, December from 12:30 – 1:30 p.m. Balog will participate in a live recording of AGU’s Third Pod from the Sun podcast immediately following the lecture at 2 p.m. in the Marriott Marquis, Level M1, University of DC/Catholic University room. AGU’s Diversity & Inclusion Plenary panel will discuss “Sexual Harassment of Women: Climate, Culture and Consequences in Academic Sciences, Engineering, and Medicine,” on Wednesday, 12 December from 12:30 – 1:30 p.m. A media availability with the panelists will be held immediately following the plenary at 2 p.m. in the press conference room, Marriott Marquis, Level M3, Shaw/LeDroit Park room. Director Jim Reilly of the U.S. Geological Survey will deliver the Fall Meeting Agency Lecture on Thursday, 13 December from 12:30 – 1:30 p.m.
AGU’s Centennial Plenary: A Celebration of the Past and Discussion of the Future of Earth and Space Science will take place on Friday, 14 December from 12:30 – 1:30 p.m.
All Keynote Lectures will take place Ballroom A-C of the Walter E. Washington Convention Center, except the Data Plenary, which will take place in room 202A of the convention center. Last year, AGU’s Board of Directors adopted an updated Ethics Policy. This policy takes a much stronger stance against harassment by including it in the definition of research misconduct and expanding its application to AGU members, staff, volunteers, and non-members participating in AGU-sponsored programs and activities, including AGU Honors and Awards, and governance. The purpose of these updates is to address persistent ongoing issues of harassment, discrimination, and bullying within the sciences. In addition the Diversity and Inclusion plenary at Wednesday, 12 December, AGU will be hosting a Town Hall session on implementation of key initiatives of the updated ethics policy on Tuesday, 11 December from 6:15 – 7:15 p.m. in the Marriott Marquis hotel, level M4, Independence A-C room. There are also dozens of events related to ethics, diversity and inclusion taking place at the 2018 Fall Meeting. Click here to see a full list of the Ethics Response to Harassment, and Work-Climate Related Events at the 2018 Fall Meeting. AGU Fall Meeting Union sessions focus on multidisciplinary topics with a broad interest to the scientific community. Town Halls offer an opportunity for government agencies, academic programs, special projects, and other focused interest groups to gather input from the broader AGU Community. New Tutorial Talks provide and expert review and synthesis of multiple results from a number of researchers so that the audience can gain a current understanding of the topic. Browse the scientific program for a list of this year’s Union sessions, Town Halls and Tutorial Talks. So far, we expect briefings on tornado formation, extreme weather events, the changing Arctic, a visit to a near-Earth asteroid, Kilauea’s eruption, Puerto Rico’s recovery from the 2017 hurricanes, the sinking of a World War I ship and more. Workshops will explore NASA’s Parker Solar Probe and new Worldview mapmaking tool and ESA’s Sentinel-5P Earth observing satellite. Experts will be available to answer questions about EPA’s proposed rule change on methane emissions. This list will grow and is subject to change. The full list of press events, including dates, times, summaries and lists of participants, will appear in a future advisory one week before the start of the meeting. All press events will take place in the Press Conference Room, Marriott Marquis, Level M3, Shaw/LeDroit Park room. Information about press conference web-streaming will be included in a future advisory. In addition to press conferences, AGU is also offering other events and activities of interest to the press, including Podcasting 101 with Jackson Watkins and a Film Making Crash Course in the Sharing Science Room (Convention Center room 203 A/B), press field trips, Open Mic Night, Story Collider and more. See #8 for more information about the press field trips and Sunday workshop. Sign up to perform at Open Mic Night here. AGU will conduct a tour of its newly renovated headquarters for members of the media 8:00 AM – 9:00 a.m. on Thursday, 13 December. AGU CEO/Executive Director Chris McEntee and AGU staff involved in the renovation will lead the tour and answer questions. 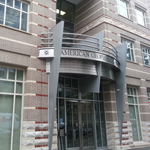 Located at 2000 Florida Avenue, NW, in the Dupont Circle neighborhood in Washington, D.C., AGU’s 62,000-square-foot building is the first-ever net zero energy renovation of an existing building in the District of Columbia. Through the use of six innovative technologies working in unison, the net zero building will effectively create the same amount of energy that is consumed onsite. Coinciding with the annual Fall Meeting and the kickoff of AGU’s Centennial celebration, the renovated headquarters embodies AGU’s vision of collaboratively advancing science to help build a more sustainable future for all. When: Thursday, Dec. 13, 8 – 9 a.m.
Where: The tour will start at 8 a.m. at AGU’s headquarters, 2000 Florida Avenue NW, Washington, D.C. 20009. Transportation back to the Walter E. Washington Convention Center will be provided after the tour ends at 9 a.m. Eligibility: This tour is open to members of the media, including staff journalists representing media organizations, freelance journalists, photographers, videographers, podcasters, bloggers, authors and filmmakers. Registration: Members of the media interested in attending the tour should register here. AGU is hosting a field trip for members of the media on Sunday, 9 December. NASA will also be holding a press workshop on Sunday, 9 December, and a field trip on Thursday, 13 December. Pre-registration for the workshop and field trips is required. Journalists will learn about how scientists and community members are working together to collect data on air quality in Brandywine and advocate for health in an unincorporated area that has no formal local government. On the tour, led by AGU partner Brandywine | TB Southern Region Neighborhood Coalition (the BTB Coalition), participants will see a power plant and other sites affecting the community and hear from community residents, local activists and scientists. The field trip will depart from and return to the Washington Convention Center. Space for this free tour is limited and priority will be given to members of the media. Click for details. Reporters can register for the AGU field trip here. All reporters planning to attend the field trip MUST pre-register; no on-site registrations will be accepted. Questions: email Nanci Bompey at news@agu.org. In this three-hour workshop hosted by NASA, experts will report on the methods and status of finding, tracking, and characterizing near-Earth objects (NEOs) and planning for planetary defense. Plenty of time will be provided for questions and discussion. The workshop, held at the Fall Meeting conference venue, is free and a box lunch will be provided. Space for the workshop is limited and priority will be given to members of the media. Click for details. Reporters can register for the NASA workshop here. All reporters planning to attend the workshop MUST preregister; no on-site registrations will be accepted. Registration to the AGU Fall Meeting is not required. Visit the research labs, satellite operations centers, and the facilities where spacecraft are designed, built, and tested at NASA’s Goddard Space Flight Center, one of the space agency’s primary science hubs – and one of the only institutions in the world able to support the whole life cycle of a space science mission from conception to manufacture to data analysis. Space for this free tour is currently limited to 20 spots and priority will be given to members of the media. Click for details. Field trip attendees MUST be registered as press for the 2018 AGU Fall Meeting to attend. However, it is not necessary to wait for your press credentials to be approved to register for the field trip. You can register online for Fall Meeting press credentials here. Reporters can register for the NASA field trip here. RSVPs for Foreign National media must be entered by 16 November 2018, in order to process NASA badging requirements. All reporters planning to attend the field trip MUST preregister; no on-site registrations will be accepted. We invite you to join your Press Room colleagues to honor and celebrate AGU’s most recent journalism award winners during an informal reception 5:00 – 6:30 p.m. on Tuesday, 11 December in the Press Room, located in the Marriot Marquis Hotel level M-3 Chinatown room. We will recognize the outstanding reporting and writing of 2018 Walter Sullivan Award for Excellence in Science Journalism–Features winner Douglas Fox and 2018 David Perlman Award for Excellence in Science Journalism–News winner Shannon Hall. 10. Celebrate DCSWA’s 30th Anniversary (and AGU’s 100th) at the DCSWA Holiday Party! Join the DC Science Writers’ Association on Wednesday, 12 December, for an evening of food, drinks, music and dancing. DCSWA members, AGU attendees, guests, and science enthusiasts are welcome! Your ticket gets you two (2) free drinks, some tasty food, a raffle entry, excellent live entertainment and four hours of serious merriment with your friends and colleagues. Bring nothing but your desire for a good time. Come for the music, stay for the food, drinks, raffle prizes and fun! Find more information on the event page. When: Wednesday, 12 December, 7 – 11 p.m. Cost: $40 for DCSWA members, $75 for members plus a guest, $45 for non-members.